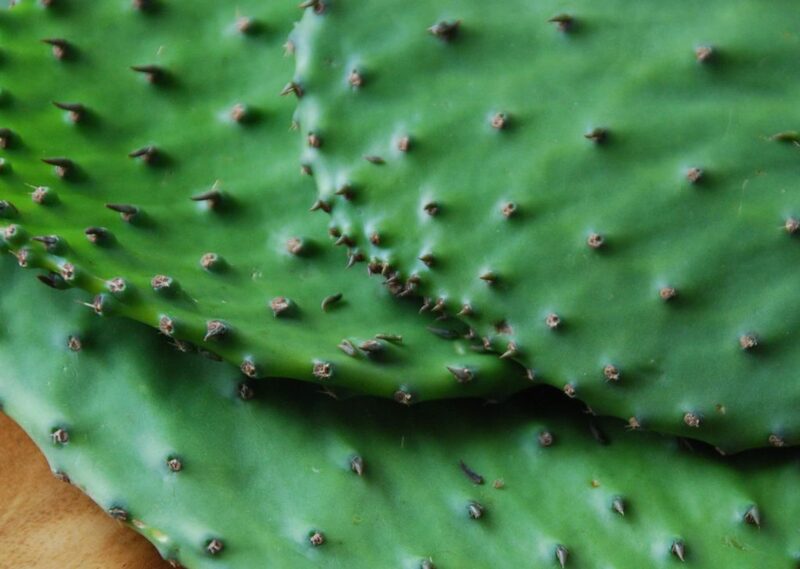 Cleaning and cooking nopales can seem challenging if you are not familiar with the ingredient. Truth is, cleaning them, can be a bit daunting at first. That’s why I CANNOT wait for cleaned and diced fresh nopales to be readily available in grocery stores here in the US, just like they are in Mexico. But while that happens, let me give you some tricks. First, to choose them, you want paddles that are bright green and although soft, not limp. The smaller the paddle the more tender it will be, but large ones are delicious too. To clean them, if it’s your first time, you may want to use plastic gloves. Rinse under cold water being careful with the thorns. Nopales are persnickety, their thorns are almost invisible, but a good clue is that wherever there is a bump there may be a thorn. Then, using a vegetable peeler or small sharp knife, pretty much as if they were asparagus, peel away the bumps and thorns, you may want to lean the nopales against a chopping board, and then rinse again. No need to peel off all of the outer dark green skin, in fact, try to keep as much as you can. Lay the paddle flat on a chopping board and trim about ¼ inch off the edges and about ½ inch of the thick base. Then slice in any shape or size, or keep it whole if it will be grilled or asada or used as a mounting base. I usually cut them into little squares and rectangles as I mostly use them for salads and soups. As for how to cook them, there are many ways. A main concern for newcomers is how to get rid of that gelatinous liquid they exude as they cook. Variations go from cooking them in salted water to adding elements that supposedly help, like tomatillo husks, scallion tops, baking soda and even a copper coin. Whichever way you boil them, once cooked you have to drain and rinse them many times. My favorite way to cook them, aside from grilling them, is to sear them in a skillet with a bit of oil for a few minutes and then let them cook covered until all of that liquid comes out, then uncover until all that liquid cooks off. Pretty much like cooking mushrooms. Not only does it work, but it also adds a nice seared flavor with merely any oil and you don’t have to drain and rinse many times. See below for precise directions, and give it a go! Rinse the fresh cactus paddles under cold water, being careful not to prick your fingers with the small thorns on its surface. Using a vegetable peeler or small sharp knife, peel away the darker bumps where thorns grow, as well as the thorns, trying not to peel off all the outer dark green skin. Lay the paddles flat on a chopping board, then trim around approximately 1/4 inch of the edges and 1/2 inch of the thick base. Once cleaned, rinse and dice into 1/2 to 1 inch-sized squares, to your liking. Heat the oil in a thick, large-sized skillet (one that has a lid, since we will need it later on) over medium-high heat. Add the diced cactus, stir in the salt and stir for a minute or two. Place the lid on the skillet. Reduce the heat to medium and let the cactus cook and sweat for about 20 minutes, until it has exuded a gelatinous liquid that will begin to dry out. Take the lid off the skillet, stir and make sure most of that gelatinous substance has dried up. If it hasn’t, let the cactus cook for a few more minutes until it does. Let the cactus cool and they are ready to go in a thousand directions including inside of a tortilla. I love Patti Mexican Table cooking show. Oh thank you so much Lillian! I stopped at the little tienda in my neighborhood. They had cactus paddles, but all the skin was peeled off. Should I buy them? Had to come home a search info about the cactus. Seems like they peeled them too much. It sounds like they cleaned them for you, that is good! Hello Chef! have you ever blanched them? Chill and toss with vinegar and herbs? This is the best ever method of cooking Nopales! Thank you! How do you take the sourness away? I was making cactus fries with cactus leafs or nopales,or paddle cactus. Wanted to take the sourness away or at least most .anybody know? Did you use fresh nopales or canned or bottled ones, Tony? The ones that are preserved are lightly pickled. Fresh ones do have a bit of a tart taste, but I love it! To find the paddles that will be the least tart, make sure that the nopales are fresh and don’t have any dark spots on the surface. I’m fortunate that here in California cleaned and diced fresh nopales are readily available and many grocery stores during the summer and can be found at Mexican markets like Fiesta and Vallarta almost year round. I like to cook mine like you do but add garlic, chile powder and diced Spanish onion. Yum. Can I dice and freeze them, and then use them whenever I want? I want to use it for smoothie, but I need a way to store it if I can’t use it all. Absolutely! And then when you make your smoothie you can throw them in directly from the freezer. I want to make a Yugo Verde power drink using nopales. I’ve never worked with them at all. Would I clean them, chop, and put into the juicer or blender – or do I have to cook or soak them first? If you are using them for a smoothie, you can puree the cactus raw. I like to make a cactus smoothie with orange juice, parsley, and celery…enjoy your Yugo Verde, Beverly! Thank you for sharing how to clean them. Did exactly as you said as far as rinsing many times…made a cactus salsa. Beautiful and delicious. Awesome! Thanks for sharing Lei. Im devorced and i love nopales so its all ways good to know how to cook them . U can make cactus salads out of them also so ,good! This helped a lot. Mom’s 88 and she’s forgotten how she used to make nopales. She helped me cut some paddles off our plant and I cleaned and diced them. Using your cooking instructions I cooked my first batch of nopales. Mom loved them and I even ate some. Thank you. Oh I’m so glad it was helpful, and I’m so happy your mom loved them. Hi, I love making your food. I saw you make a grilled corn and cactus leaf salad, I remember most of it. Could you please share it. It looks so yummy. Thank you. ooh thanks a lot, little did I know about how healthier usefulness this plant could be. Can I add the cleaned and diced fresh nopales to hot water, wait for then to cool then drink the water? Yes you can drink the water for sure…but I don’t know how much you are going to like it! “Cactus Paddles or Nopales” I tried it and I was surprised because I only knew how boiling it. Thank you for your help. I’m so glad I could be of help, Esmeralda! I just cooked some and they turned out flavorfully crispy yummy! I will be adding them to eggs in the morning…yum!!! after cooking the nopales we add beaten eggs to the skillet, cook then serve in tortillas. yum! You can get a self-lighting blowtorch at Home Depot for around $30 and use it to burn off the tiny, persnickety thorns. You can burn them off before you cut them off the cactus or you can cut them off the cactus and burn the tiny thorns off in the comfort of your kitchen. Flip a cookie sheet or metal baking pan over (so there is an air gap protecting your counter top from getting burned.) Put the nopal on the cookie sheet and hit both sides quickly but thoroughly “against the grain” so the green, fleshy nub doesn’t protect the thorn from the flame. Now you can rinse and trim without worry! Thank you Pati, lightly frying Nopales delivers the best taste. I told my mother from Mexico she was amazed, boiling was her only method. Once finished you have so many options, but Nopales salad with queso fresco, is my first choice, my friends ask if I was angry when I make the salad, because I use so many Serrano’s love your show, it’s the only one I record. Oh thank you so much for tuning in Jim! Can you eat it raw? You can eat it raw, but in Mexico we always puree it if it is raw. We make a smoothie with orange juice, parsley, celery, and cactus…it’s delicious! Pati, Right now I am cooking nopales this way…I was so desperately looking for this post (like SOS), since I want to keep all of the properties without rinsing the slimy stuff (baba). Thank you!! Mary those thorns are very persnickety….but they are so delicious! my grandmother was from Mexico City or actually Dolores Hiladgo, she loved nopales and cooked them for us with eggs and with chili for my parents. to this day my mother loves them with eggs and my brother in law mixes them with tamales for breakfast…. Carmel, thank you so much for sharing your story. Your grandmother sounds like a wonderful cook! Better to cook and eat them! Hola Pati ~ I will be in your neck of the woods for Christmas and would like to know where to find nopalitos to substitute them in a green bean casserole. Couldn’t find them last year at the Safeway etc. Also you are the BEST host of any cooking show! You are so intelligent, knowledgeable, and such a sweetheart. When they made cooking, and then television, they waited for you to complete the perfect combination!!! Your show is such a delight! Thank you for teaching an old dog, a few new tricks! I will check in again for more tasty num-nums, lol. Too funny!! Thank you for trying it! I want to eat them for the health benefits, so I don’t want to get rid of the gelatinous substance. But I don’t like eating slimy stuff either. Does anyone know if this method still preserves the health benefits? Even though it’s no longer slimy, maybe the mucilegenous properties are still there…? Absolutely Monica, it is still in there. I’m curious if anyone has tried drying them out in a dehydrator just to see how they turn out. The inside of the paddles will have a thick, gelatinous substance(kinda like okra), but the outside of the paddles should not be slimy. FYI My mole de olla was awesome! I was at Fiesta(grocery store in Texas) again today and found bags of beautiful pre cleaned and cut Nopales! They looked so good I had to buy them. I have had nopales before while eating out and they are IMO tastier than green beans! Do you think drying them out after cooking is the best/quickest way to go to eliminate the gel? Would adding some tomatillos be good flavor wise? I would love to have my husband become comfortable cooking different foods but its finding the best way to cook them. Even though he likes okra( talk about making gel!) he won’t try to cook the nopales. I must make them as yummy as possible to overcome his mental block to Nopales. Any additional hints! Hello, thank you for this post. I like nopales. I actually give it to my family because of the gelatin. I try to drink it all or jot over cook it. It heals the lining of the gut. Doctors recommend it. Good to know! Thank you for the information!! Why is it sour? I made it like you said and my Mexican boyfriend, who had a crush on you, even said it tasted like there was vinegar added. Is this normal? I’m trying to learn to cook like his mamsita. Please help! Hi Cristi, Did you use fresh nopales or canned or bottled ones? The ones that are preserved are lightly pickled. Fresh ones do have a bit of a tart taste, but I love it! You have to make sure that the nopales are fresh and don’t have any dark spots on the surface. Hola Consuelo, Thank you for your note! My mother loves nopales in smoothies, too! Sounds delicious. Soy una gringa, but I saw the cactus leaf at my local store and really wanted to find out what to with it. especially ’cause it was only 25 cents. It was worth trying. I made it this morning via your easy recipe and we had it in a soft taco (corn) with cheese and Del Taco sauce, our favorite. It was delicious. Thank you, or, gracias! So great to hear you gave it a try! What are other ways to eat the cactus? My husband ate it several years in Mexico he sad it was on the tables as salsa. I found it in a Mexican store bought it found your Webb sight and fixed it, the girl at the store told me to but it on eggs. add flour to absorb it, is not a problem. I dice them, salt them, add enough flour to coat them,then a little corn meal to add some crunch. Fry them in a skillet just like you would okra. Thanks for sharing, Jean! Sounds tasty!! How do u know when they are done cooking i am boiling them. Hi Crystal, Simmer them for about 10 minutes! From our garden we obtain these right off our beachfront in the Philippines! I hope you enjoy them, Maryanne! Good luck with the project. Very interesting!! When my husband saw your email he insisted that I tell you we watch your show always and he loves your accent. We live in Central Texas so we can use all your recipes and tips. Love you and your family trips. Hi Irene, The kind we usually eat is called a “prickly pear” cactus. Maybe ask your neighbor what kind his is before eating? Hello. I live in Andalucia, Southern Spain and this plants grows wild everywhere. Never knew you could cook the big what I call ‘leaves’ but I do know that the fruit if despiked, washed and then put in the fridge makes a wonderful thirst quenching ‘drink’. I know that the green leaves can be picked up from the roadside, and left in the sun to dry out when the flesh can be taken out and you are left with beautiful skelton lacy object to be used in your crafts. Thank you for your recipes. Recently I decided to change my diet and serve nopales at least twice a week. I love to cook and cooked nopales per your recipe and added shrimp (season per your taste) with juice of two small limes. Let it cool. I filled wonton skins, fried them and served with salsa. Que Rico!! Thank you, Nancy! Sounds sooo delicious!! I renounced meat for Lent so I have been trying tons of new (to me) vegetables lately. Never tried nopales before but these guys did remind me a lot of okra, in more than just the goo, but also the slight sourness to them. So I searched for this a little late: after I just cooked up a bunch of pre-chopped nopales from HEB (Texas Grocer). Rinsed really well in a colander. Seared over medium high (just below smoke point) with EVOO. Reduced heat to medium low and added chopped red bell peppers. Covered, turned off heat and let sit for half and hour or so. I think that the digestion part is true because I’m typing this from the toilet. Great information and you make it look so easy. I am in Mexico and living eating the cactus and so found your post fantastic! 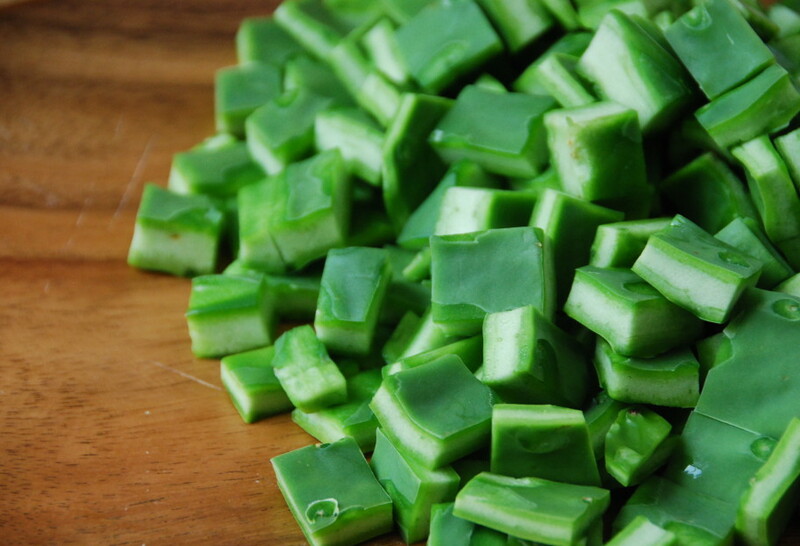 I freeze Nopales after parboiling for one minute, cooling and cutting into strips (or squares). I pat dry them to reduce moisture in the freezer bag or vacuum pak. You might find it fun to experiment to see how many different ways you can use Nopales. It can be used raw in many different salads. Cooked and cooled it can be used as substitute in any almost any kind of salad. It can easily be an added or substitute ingredient in cooked main course dishes. I have not tried, but expect it could even be made into a desert item with a little added honey or brown sugar. Always look for the tender pads from the younger plants. It grows wild in many parts of the US,and is cultivated in AZ and probably more places in the US. I have always loved nopales, but never cooked it at home. I used your recipe for my first time cooking it. This was the best I’ve ever had!!! Over 30 years of eating it, and now I won’t want it any other way! Thank you so much!!! So easy! So glad you liked it, now it can be your home staple! I live in Chicago and we grow them here. The Jon’s Market on Magnolia and Laurel Canyon in North Hollywood usually sells fresh cactus leaves. I live in Sherman Oaks, Ca. How do I get my markets (whole foods) to carry this pad. Perhaps you know where I can get it fresh nearby already boiled and peeled. I do not want to purchase them in a jar or can. Best idea is to try Latin stores near you, or you can talk to the produce manager of the stores you frequent and put in a special request. The more requests they get, the more likely they will carry them! Es, I also live in Southern California. I just saw nopales at the Alhambra Farmers Market yesterday (Sunday). I can’t guarantee that they’ll be there every week, but I’ve seen them there a few times! Just wanted to drop in & say that mi jefa (mom),,,, tha best cook ever of course,,, uses banana peels when she boils or cooks them to remove la vava (slime). I have a friend who swears Nopales has lowered his blood pressure to the point he off medication. I have no idea if it really has helped him or not. I recently started putting it into my daily green drink. I have also tried it in salad. (Good). My favorite was ground with spinach, kale, Swiss chard, Jalapeno pepper and chicken, rolled into meat balls with one egg to help hold it together, and served with my wheat spaghetti. Health benefits of Nopales as found on the web. Nopales are one of very low calorie vegetable. 100 g of fresh leaves provides just 16 calories. Nonetheless, its modified leaves (paddles) have many vital phytochemicals, anti-oxidants, vitamins, and minerals that can immensely benefit health. The succulent paddles are rich sources of non-carbohydrate polysaccharides like pectin, mucilage and hemicellulose, which help reduce LDL-cholesterol, diabetes, and weight reduction. This rich fiber and mucilaginous content aid in smooth pass through of digested food particles and relieve constipation condition. In addition, the juice extracted from these pads has been suggested to have immune-booster, and anti-inflammatory properties. Cactus pads feature moderate amounts of vitamin A with 100 g fresh pads provide about 457 IU of vitamin A, and 250 µg of ß-carotene. ß-carotene convert into vitamin-A inside the body. Studies found that vitamin A and flavonoid compounds in vegetables help to protect from skin, lung and oral cavity cancers. 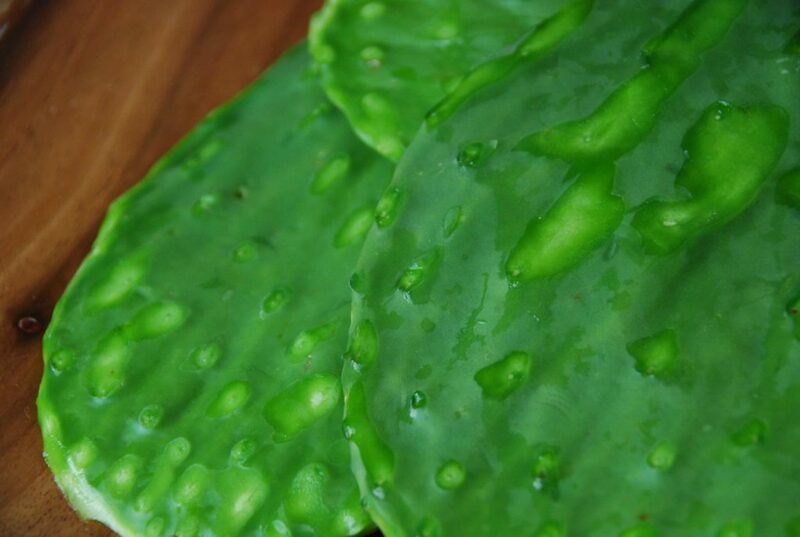 In addition, nopal pads contain small levels of B-complex group of vitamins such as thiamin, riboflavin, niacin, vitamin B-6 (pyridoxine), and pantothenic acid those are essential for optimum cellular enzymatic and metabolic functions. Fresh pads contain average levels of vitamin C. 100 g provides 9.3 mg or 15% of this vitamin. Vitamin C is a water-soluble, natural anti-oxidant, which helps the body protect from scurvy and offer resistance against infectious agents (boost immunity), and help scavenge harmful, pro-inflammatory free radicals from the body. They contain small amounts of minerals, especially calcium, potassium, magnesium and iron. I’ve never cooked with cactus before and want to try adding it to my black beans. I would cook them separately of course but should I wait and put them in at the end or can I add them sooner? Hola Tommy, Add them at the end, since you are cooking separately. Sounds delicious!! I have always wanted to try and cook this as well as my father in law. He and a group of misfit family member, Myself included have a cooking show that will be featured on The Rachael Ray show coming soon. I will be trying this recipe on Sunday to give him a going away present. Monday he is flying to Nueva York to be on her show and I would like to give him the something new to expand his inspiration. Hi, two years ago I started a prickly pear plant because I wanted the pears. good for you in them. Thank you. Hi Pati, can you eat it raw with salads or smoothies? I have never eaten nopales raw… However, they are pureed raw into smoothies or licuados. I grow my own cactus but they are thorn-less, surprised you haven’t recommended these. If your followers want thorn-less varieties to grow just look for them at just about any ornamental garden, take a pad throw it on any well drained soil and it will grow. All cactus here in Texas have thorns except the ones in our flowerbeds, but be careful they may hybridize. FYI the real treat are the fleshy, 1/2 inch, bright green tubercles that replace the thorns, great raw. Also we make really good purple prickly pear jelly. Thanks for the info JD! how do I look for one? do you know where they sell them? Depending on where you live, who may sell or have them… You can start by asking any local plant/flower store? Just moved to a neighborhood where the local grocery has pre-cleaned nopales. I am so excited to try them as I love trying new foods, especially vegetables. I never met a vegetable I didn’t like! Thank you for your directions. I’m confident now to experiment with them. I think you are going to love them, Alison!! Googling around I found this page. Maybe the place to find a answer to my question? Living in Cyprus, a small island south of Turkey and Greece, we have plenty of wild cactuses here that looks like cactuses eaten in Mexico. But I can’t find out if this paddles are eatable or not. The cactuses here looks the same, but they also give cactus fruits that are popular here. A green, yellow and later red fruit. How can I find out if the paddles is the same or eatable? I live on Cyprus too! I hope you have tried eating the cactus already. I have grown and eaten the cactus on Cyprus and it tastes just like at home! Hi Bruce, You are making my mouth water! Thank you for sharing!! Was looking for the best way to cook the cactus paddles and found your method the best! Thank you! I was shopping at a local produce stand and ran into a Latino man who told me this is the best food to lower blood sugar.. This is my quest! Here we go! Thank you, Lori! Cactus paddles are SUPER healthy!! I saw the show with cactus paddle tostadas but didn’t write down the recipe. Where can I find it? My girlfriend and I decided to make these after catching your show, which we love, on Create/PBS. I got the hang of de-prickling the nopales by the second paddle. The prep work was totally worth it… the nopales turned out delicious using your method. Thanks for the cactus council! Erik, I’m glad you went for it with the cactus paddles!! Thank you so much for watching the show. Hi Pati! My husband and I are new fans of your show on Create/PBS here in Alaska. Thanks so much for this article! I recently bought a fresh cactus paddle at the supermarket to “play with” and had no idea what to do with it. Now I can’t wait to cook it up- it will be my first time tasting cactus! Jordan, I’m so happy you found my post, as cactus paddles can be tricky for the uninitiated!! Please let me know what you think once you’ve tried it. Hola Pati, viewer from Los Angeles. Thank you for the episode on cooking nopales. I love nopales but the gelatinous liquid always an issue no matter how many gallons of water I use to rinse and I’m not a fan of the jarred ones sold at the grocery. I’m going to try this method as it sounds like it would work to dry off the liquid in the pan. Enjoying your show…. Feliz Navidad! Hi Gilda, Thank you so much for watching the show!! I hope you will find this method helpful. Hi Pati, my mother simply boils the nopales. The secret is she adds a piece of bread. She says that the bread absorbs all the sticky stuff. Have you heard of this method. Great tip, Carlos! Have to remember the bread next time! !